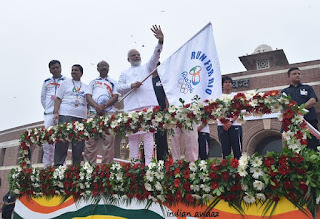 Prime Minister Shri Narendra Modi here today flagged off the RUN FOR RIO from Major Dhyan Chand National Stadium(MDCNS), India Gate to Jawaharlal Nehru Stadium (JNS), Lodhi Road amidst Olympic spirit and cheers to celebrate the Olympic mood in the country. 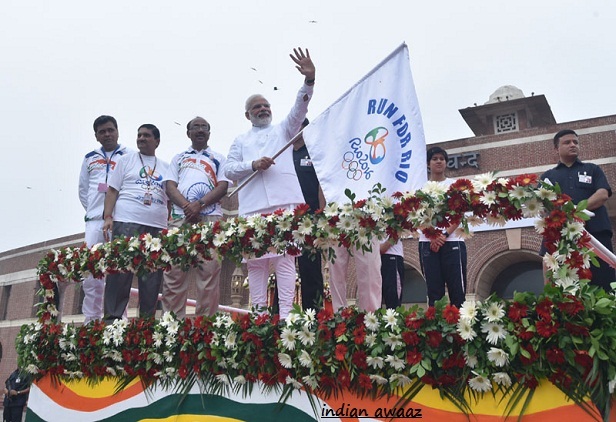 Thousands of school children and youth participated in the 5 Km run to demonstrate to RIO bound Indian athletes that the whole country is proud of them and wishes them all the best in the forthcoming competitions. The Prime Minister also released a publication of SAI on “Indian Olympics Journey,” which carries interesting information on country’s Olympics achievements and preparations for the future. Prior to the flagging off, Shri Narendra Modi paid floral tributes at the statue of the Hockey wizard Dhyan Chand in National stadium. The RUN FOR RIO was organized by the Ministry of Sports and Youth Affairs to connect public at large, especially children and youth, with the Olympic spirit and power of sports. India is sending its largest ever contingent of 119 athletes to participate in the Rio Games.